Please mind that the upgrade us EITHER possible with the leg press (module 3) OR the leg extension/leg curl (module 2). Attaching both modules on the basic module is technically not possible. 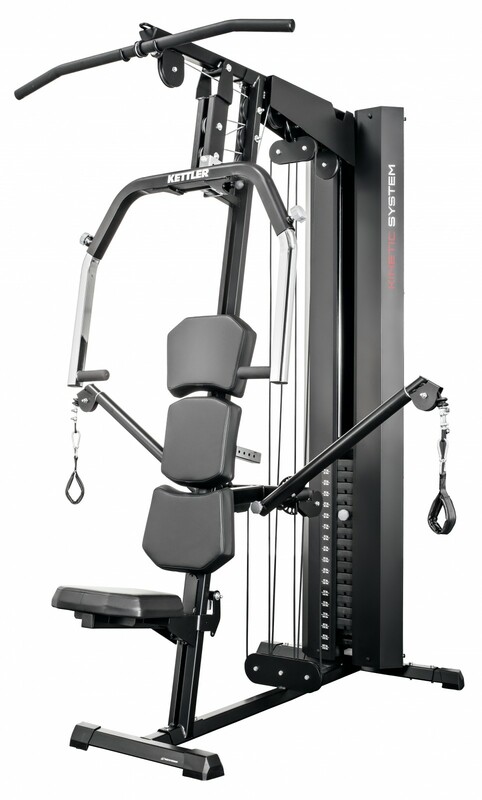 The new modular Kinetic system of Kettler: Compile your multi-gym according to your needs. The Kettler multi-gym Kinetic Basis is the main part of the new modular multi-gym system of Kettler. Many exercises can already be done on this basic module. It is upgradable by further modules as required and be thus adapted to your personal needs. The multi-gym can be extended by a double cable control, a dip module, and a leg press or leg extension/leg curl module. The basic module offers the possibilities of lat pull, bench press, rowing, and butterfly. Via the 3D- Flexmation system (cable controls on moving arms), some further training can be done. Flies, crunches, armcurls, leg adduction, and abduction are just some other training exercises. F5 multi gym is an excellent high-quality product. It is easy to assemble and comes in safe and good packaging. Brilliant ! Kettler leg extension/leg curl Kinetic In stock! Kettler multi-gym Kinetic Basis add to comparison list.